Last year I wasn't watching Mad Men. Then, for no reason, I watched season three on demand. I was hooked, and continued to watch the series backwards as I anxiously awaited season four. I wasn't watching when the Banana Republic Mad Men Casting Call was going on, but this year I've been waiting. For the past few weeks I've been positively obsessed with working on an outfit and taking the pictures to enter! 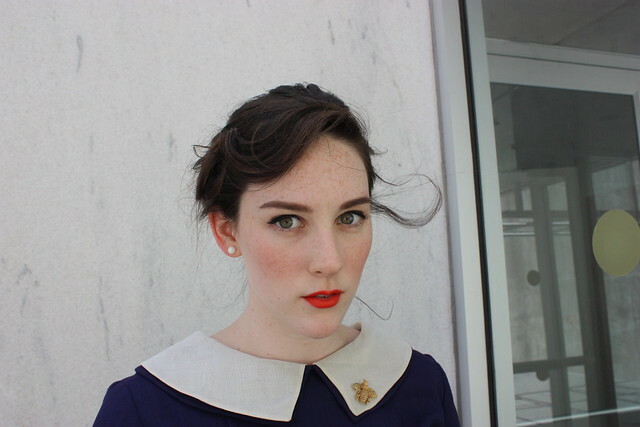 Screaming about the wind and uncomfortable nature of vintage foundation garments. This is another Thought About it For a Week and Then Went Back and Got It dress. It's from Twilight Vintage in Troy (it's a dream there, a wonderful vintage dream) and it's been staring at me for months wondering why I wasn't wearing her. Suddenly, I realized this was the perfect debut opportunity. I've been affectionately calling it 'The Joanie Dress' since the second I tried it on. I found a pair of my grandmother's gloves to wear--they don't fit in the worst way! I have huge hands ( I have to wear the large gloves at work! ), but thankfully they just look dainty in pictures instead of tiny. I remembered I had these shoes lurking around from two summers ago, even though now they are decimated, and borrowed my mother's vintage Avon bee pin along with a delicious leather bag from France she snagged at an estate sale ages and ages ago. I tried my best with hair, although it really deflated badly in the wind, and ran crazy trying to find the perfect shade of coral lipstick. All of my usual haunts and brands let me down, till I found a gorgeous shade at Target (Revlon, Coral) for pennies! I even wore period-accurate undergarments! It was rough. I will admit, I skipped the stockings because I couldn't keep my shoes on with them (and they're the neatest little things with original 1960s packaging, I didn't want to stain them with my shoes) but all the rest of it was there and boy. Stand up straight you do! My entry is now up! Love the red lips, it really completes the outfit and the fact that your nails match. Lovely. p.s. good luck in the competition! You have my vote! Oh wow you look absolutely exquisite!!! Good luck! You stunner you! that dress fits you like a glove! Good luck, you're sure to make an impression! I'm so impressed by how authentic you look. 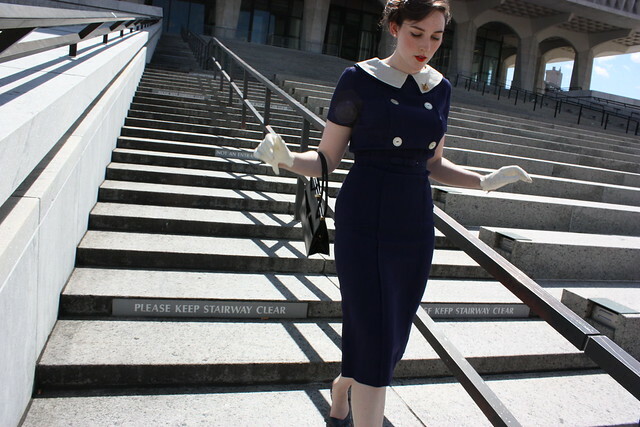 Gorgeous outfit from head to toe--you look like you just stepped out of a 1960s fashion ad. ;) Just voted for you! Oh I definitely voted!! This is all so so so gorgeous, I can't even. Perfectly put together! Oh this outfit is perfect. 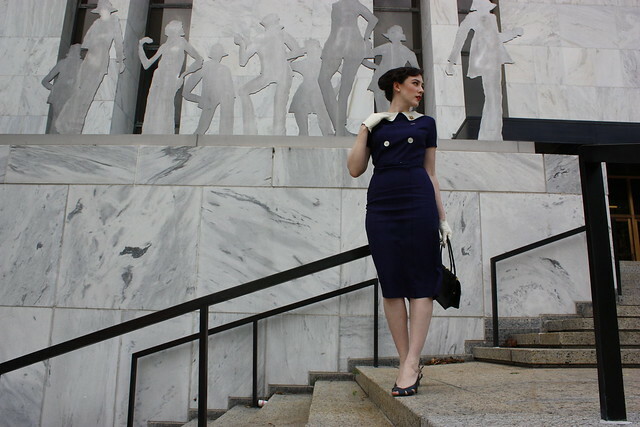 Totally Mad Men inspired! The dress is gorgeous and so are you.Really amazing outfit overall! I definitely voted for you. Perfect, perfect, perfect! Thoroughly worthy of The Joanie title. I've been eagerly anticipating season four too, I'm so glad its back! you look so pretty!! that dress is so cute. I think this is my favourite post from you that I've read so far. 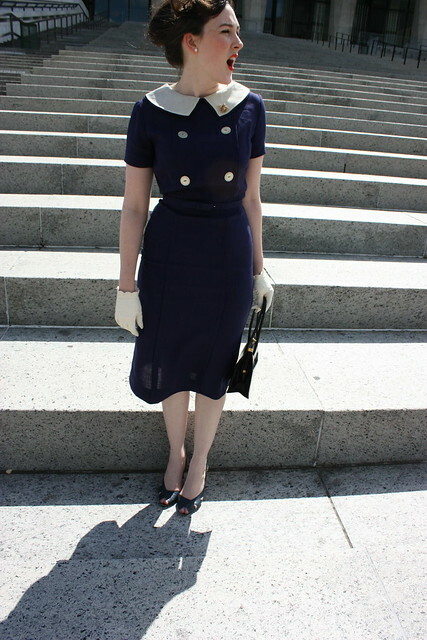 My sister and I really got into Mad Men recently and I must admit Joan makes me feel so frumpy! I hope you do well in the competition, you've obviously gone to a lot of effort and you look amazing! you most certainly got my vote with this perfect-for-the-decade and oh-so-lovely ensemble. I voted! a girl from my school did this last year and if I recall you can vote everyday so I will keep checking back. I love that show it would be great to see you on it! You look amazing! So authentic! i love your outfit! voting for you! You loooks so cute and authentic, definitley voting for you! wow. you look amazing! i just voted for you! i really hope you win!! It must be you, you are amazing, it's a blast from the past ! And you've got a perfect face for this ! amazing!!!! the accessories are perfect. You totally have my vote, Kater! 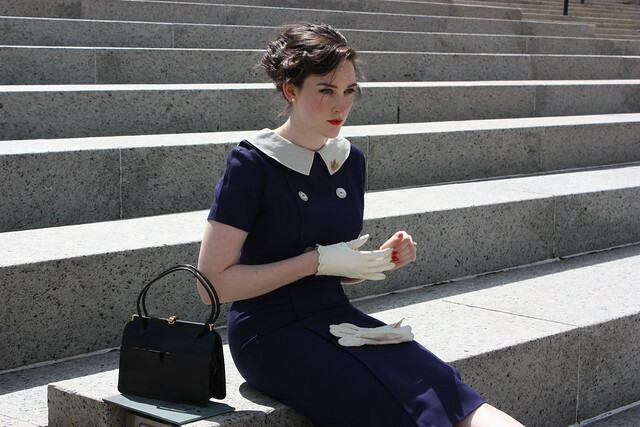 You perfectly look the part.The makeup, hair and styling all scream Mad Men. Why that dress looks like it was made just for you! And you look so so very lovely with red lips! It's wonderful you get your grandmother's gloves, I wish my grandma could give me everything she wore at the time! But some of it is lost among the years. Gonna go vote for ya dear! You look stunning!!! Voted for you, of course! Good luck! You're gorgeous and your dress is amazing! I hope you win! These pictures are beautiful and this is my favourite outfit of your's so far you look stunning. I have been reading you blog for a little while now and have finally got around to commenting. oh my goodness, drop dead gorgeous. you look amazing- perfectly 1960s & the dress fits you to a t. you definitely have my vote! where do i go to cast it? sorry, just saw the link. duhh! i don't know how i missed it. good luck! you look incredible in those photos. You really ought to win. I voted! I love this dress! you are so lovely. off to vote for ya! You look amazing, every single detail is perfect! I might post a link to this post on my blog if you don't mind. It's such a lovely outfit and you deserve as many votes as possible! I think you look perfect! good luck! i love love this! hope you win. i voted for you. ps. i have linked to you on my blog, maby you would like to link to mine? ds. wow, that dress is truly gorgeous. lovely photos, as always! First off, LOVE this outfit. It is perfect. Secondly, you are absolutely stunninglly beautiful. I thought you should know, in case you don't already. And thirdly, will go vote for you now. Oo oo! You look positively classic! I voted. Good luck! this is like the best thing ever! Voting for you right now, sweet. I honestly couldn't think of anybody more suited to this role. You are such a beautiful, wonderful fantastic person, they would be crazy not to cast you. Good luck, my dear, you really do deserve this. Beautiful pics! Voted for you! holy cow that dress was made for you! you would fit right in with all the mad men ladies! i'm seriously loving these photos! Gorgeous! I've seen your photos working the Tumblr circuit and you're definitely the crowd favorite! Wowwww, I'm going to have to invest in some of those there vintage undergarments if they can make my figure look like this!! I can't believe some of the people in the lead, they didn't make half as much effort as you. What a wonderful dress, perfect wiast, collar, buttons... my oh my! voting for you every day! I saw your photo when I went to vote for someone else and voted for your as well! You look absolutely STUNNING! Oh, goodness, these pictures are wonderful! I especially like the one with your back facing the camera, certainly very Joan Halloway! No on compares...to you. You have my vote, Good luck! is there a chance to get the exact description / name of the lipstick? i want to own this lipstick SO MUCH - I HAVE TO! I love Twilight Vintage in Troy! I went to Russell Sage College and until recently called Troy my home. Giveaway: Shabby Apple, Oh la la! 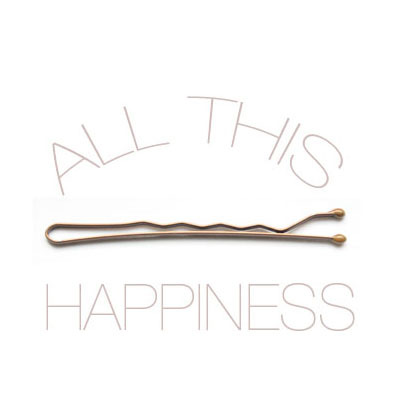 All This Happiness on The Fashion Spot!